On September 28, 1965, with only 10 days remaining on his tour in Vietnam, Marine private Bobby Garwood fell into enemy hands just north of Da Nang. For the next 14 years Garwood endured abuse that few of us can fathom. But it wasn't just the Viet Cong who kicked him around. Garwood was on a hit list -- his own government wanted him dead. Monika Jensen-Stevenson gives us the details in her gripping book, Spite House. Jensen-Stevenson writes: "The next three weeks were a living hell. Garwood was herded from village to village. He was trussed like a chicken for the pan. Blindfolded so that he had no idea where he was being taken, he guessed from the gradually more muted sounds of American airplanes taking off and landing that he was moving away from Da Nang. People pinched him, stoned him, pulled his beard and body hair, and spit on him. His wounded arm received no care. It swelled to the size of his thigh and began to rot and stink." That was just the beginning. Though he conducted himself heroically throughout his captivity, almost from the moment he was taken U.S. intelligence inexplicably considered him a traitor. As a result, he became the target of hunter-killer groups, mostly well-trained Marine snipers who were deployed to eliminate other -- get this -- other AMERICAN GIs in Southeast Asia. Equally puzzling, the Viet Cong and North Vietnamese thought he was a CIA operative and consequently moved him frequently from camp to camp to try to prevent his rescue. The enemy undoubtedly saved him from U.S. government assassination. The lie about Garwood virtually destroyed Lt. Colonel Tom McKenney, who headed up one of the hunter-killer groups three years after Garwood's capture. McKenney was a dedicated career Marine officer with a "the tougher-it-gets, it's-just-right-for-me-and-my guys" attitude who believed in the Corps and the leadership above him. When he heard about this "traitor" Garwood, he took personal responsibility for hunting him down and killing him. Garwood, according to official decree, was an enemy collaborator and had to be eliminated. McKenney never questioned the word from the top, and from day one he went after Garwood with a vengeance, but never could find him. Finally, McKenney learned the truth. "I realized that my government had done the unthinkable, not only in betraying Garwood but in using me and others like me as murder weapons. How many other innocent and brave men were made to look like traitors?" The story that unfolds is about a man's heroic effort not only to survive, but to win. Garwood aided, comforted and consoled other POWs during his years of captivity, but he always sought to escape. After an eternity of hell, he succeeded -- he actually engineered his own freedom. His reward from an embarrassed Washington establishment: a dishonorable discharge, charges that he was an enemy collaborator, denial of $148,000 in back pay that had accrued from the day of his capture in the line of duty, and denial to a real hearing. Bear in mind that this ordeal ended in 1979 -- AFTER that great son of Georgia and recent Nobel Peace Prize winner Jimmy Carter had proclaimed to the world that there were no more POWs in Vietnam. Bobby Garwood escaped AFTER that proclamation and knew of hundreds of other POWs who were still languishing in enemy hands. The government's treatment of Garwood is one of the great injustices in U.S. history. His court-martial was a travesty. That he survived his POW ordeal was a miracle. To escape and be dishonored by the organization that sent him into war was unconscionable. Spite House is a brilliantly written narrative. Monika Jensen-Stevenson is a courageous writer, and all of us who are familiar with how little the government has done on behalf of our POWs and their families salute her. Considering the fact that the United States is now the policeman of the world, does anyone doubt that there will be more Vietnams and more Bobby Garwoods in the future? 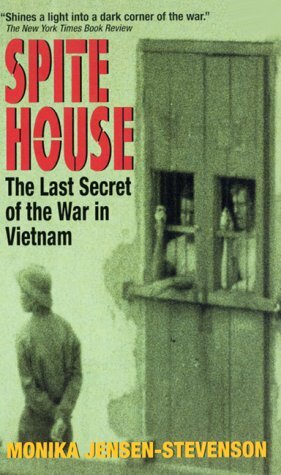 Spite House is therefore required reading for anyone who is seriously thinking about joining our country's military. 1. Jensen-Stevenson, Monika, Spite House, W.W. Norton Company, New York, 1997.